In Canada, doctors are higher status. I’ll exaggerate the difference and call Canadian Doctors Gods of Medicine and US Doctors Counselors of Medicine. Gods of Medicine have appointment calendars stretching off into infinity. They have the POWER to bestow HEALTHCARE upon worthy or unworthy as they see fit. Counselors of Medicine are more like accountants or lawyers. They have a business and have clients they want to retain. Your health is a bit more important than your taxes, sure (maybe), but these folks are happy for your business just the same. Gods of Medicine bow to no man or worman. Their will is absolute and they control your access to the entire healthcare system. Counselors of Medicine are in business. They can be jerks, but they’ll lose customers. They can be sued and go out of business. Mostly, though, they want to assist you in getting what you want from the healthcare system. Life is harder as a Counselor of Medicine. Maybe that’s why ‘Gods’ are more satisfied with their jobs? Very Chicago School of you. 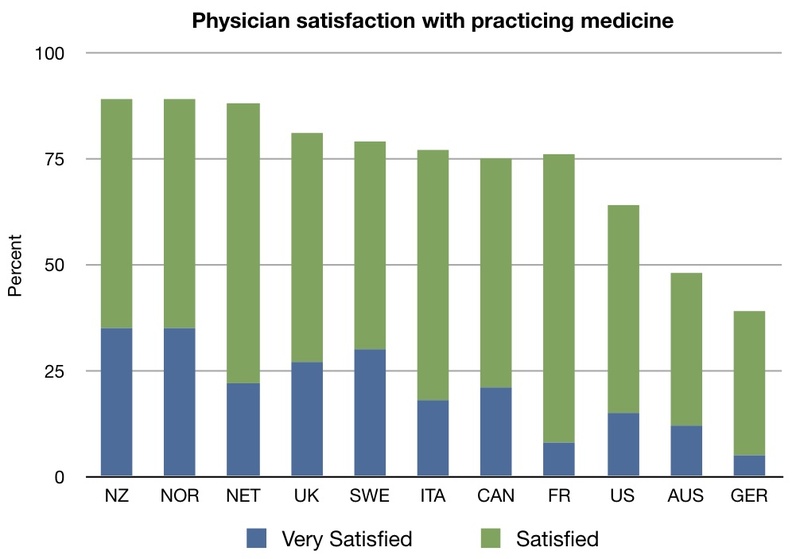 You indicate that the relatively greater satisfaction levels of Canadian doctors may be a result of great power coupled with great respect as compared to their foreign counterparts. Might it also be the reality of a consistently increasing income without an incentive to work harder for it?